Hang with me on this one. At first glance, you may be surprised to see the names Eckhart Tolle and Rick Warren in the same sentence. Your surprise may turn to sheer shock when I propose to you that 80-90% of their message is the same. How could that be?? After all, isn’t Eckhart Tolle a New Age spiritual teacher? And, isn’t Rick Warren the pastor of an evangelical Christian megachurch? Surely that must mean they are on completely different ends of the spiritual/religious spectrum. However, after reading A New Earth: Awakening to Your Life’s Purpose (Amazon) by Eckhart Tolle and The Purpose Driven Life: What on Earth Am I Here For? (Amazon) by Rick Warren back-to-back (and taking 10,000+ words of notes from each book), I noticed way more similarities than I did differences. After some quick Googling, I was unable to find any content that compared these two life purpose powerhouses. Both authors have sold millions of books; if you search Amazon for “life purpose,” you’ll see that these two books have 4,000+ ratings. The only other book up there with them is Man’s Search for Meaning (Amazon) by Viktor Frankl (on my reading list next). Please keep in mind, the insights and analysis provided in this post are from my own personal interpretation of the books and messages. Your takeaways may be different than mine. If they are, I’d very much enjoy a constructive conversation in the comments! Before we dive in, some quick housekeeping: All quotes are from the authors unless otherwise stated. I have organized my notes into my own categories, and I’ve added bold to some quotes for emphasis. 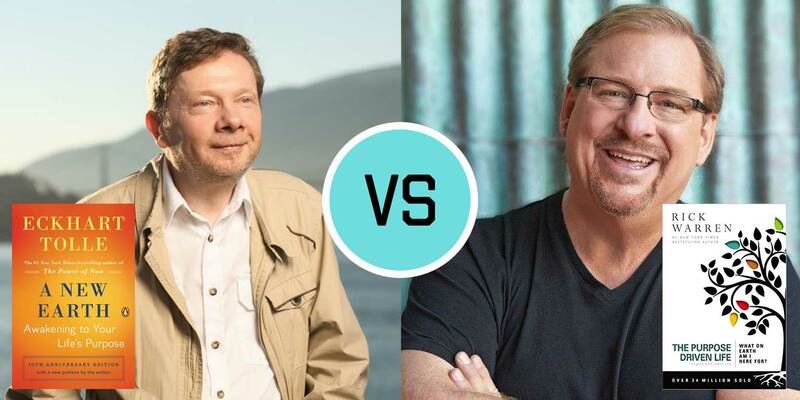 Life Purpose Showdown: Do Eckhart Tolle (“A New Earth”) & Rick Warren (“Purpose Driven Life”) say the Same Thing? Let’s start with a quick bio of Tolle and Warren. You’ll notice vastly different upbringings: Warren seemed to have an uneventful childhood while Tolle’s was anything but stable. Warren had his “aha moment” at age 19, ten years before Tolle’s at age 29. Childhood: Born and raised in Germany. Unhappy, his parents fought and eventually separated, and he felt alienated from a hostile school environment. 13 years old: Moved to Spain to live with his father. 15: No high school; studied literature, astronomy and languages at home, read several books written by a German mystic. 19: Troubled by “depression, anxiety and fear”, he began “searching for answers” in his life. 20s: Tolle decided to pursue his search by studying philosophy, psychology, and literature; enrolled at the University of London. 49: Published The Power of Now. 57: Published A New Earth. Childhood: Born and raised in California. His father was a Baptist minister, his mother a high-school librarian. 19 (Aha Moment): Called to full-time ministry when he was a student at California Baptist University. 48: Published The Purpose Driven Life. Spiritual awakening = becoming free of identification with form. Let’s start with an obvious topic. Eckhart Tolle is not aligned with any particular religion or tradition and pulls insights from all of them. Rick Warren was raised Baptist and is an evangelical Christian pastor. 1. Eckhart Tolle focuses on a way out of suffering whereas Rick Warren focuses on a way to be saved. 2. Tolle focuses more on humanity’s evolution whereas Warren focuses more on humanity’s eternity. 30. How identified are you with your thinking mind? 31. Are you unconsciously or consciously creating content in your mind?